His time on the big screen as the character may be over, but Ron Perlman will always have his name synonymous with Hellboy. First starring as the titular superhero in Guillermo del Toro's 2004 movie Hellboy, Perlman helped carve the character's place in modern pop culture. Looking back, it's clearly a no-brainer for del Toro to cast Perlman in the role, considering how perfectly it wound up working out. However, when del Toro was still conceptualizing the film, it seemed he was alone in his desire to see Perlman star in the movie. As revealed by Perlman recently on PeopleTV's Couch Surfing, del Toro remained adamant on this decision, refusing to move forward with the movie until a studio granted him this request. "I said to him from the get-go, 'That's a great idea, and god bless you, I love you for entertaining the idea, but it'll never happen.' Sure enough, for seven years he'd go to these meetings at these studios, and he'd say, 'Ron Perlman.' Blade II opened to like $40 million on the first weekend, and everybody wanted to do Guillermo's next movie, and he said to himself, 'If I'm ever going to get Hellboy done with Ron, it's going to be this week. Sure enough, somebody said to him, 'How do I get in the Guillermo del Toro business?' and he said, 'Well, I really want to do this movie Hellboy.' They say, 'Any conditions?' and he says, 'Yeah, Ron Perlman,' and they go, 'Hmmm... Okay.'" Hellboy would rake in nearly $100 million at the box office, making it clear Guillermo del Toro was onto something with his vision. It did just as well with the critics, and even Roger Ebert praised the film by giving it three and a half stars. Perlman would later reprise the role in the 2008 sequel Hellboy II: The Golden Army, which fared even better with over $164 million in theatrical ticket sales. Like the first movie, Ebert gave it three and a half stars, and the critical reception was overall very positive. Among other qualities, both movies saw universal praise over Perlman's performance in the lead role. For many years, del Toro had been planning a third Hellboy movie, once again bringing back Perlman to star. Unfortunately, the filmmaker ran into some issues finding a studio willing to give him the budget he saw necessary for the third movie in the trilogy. While the first two movies were successful, the project was still seen as a gamble due to its high budget. By 2017, del Toro had announced that he was no longer planning to do his planned Hellboy III, and his time with the franchise had come to an end. When Neil Marshall signed on to direct the next movies in the series, Perlman returned the favor to del Toro by refusing to be involved without the original director's involvement. The choice was then made to reboot the series with an all new actor. 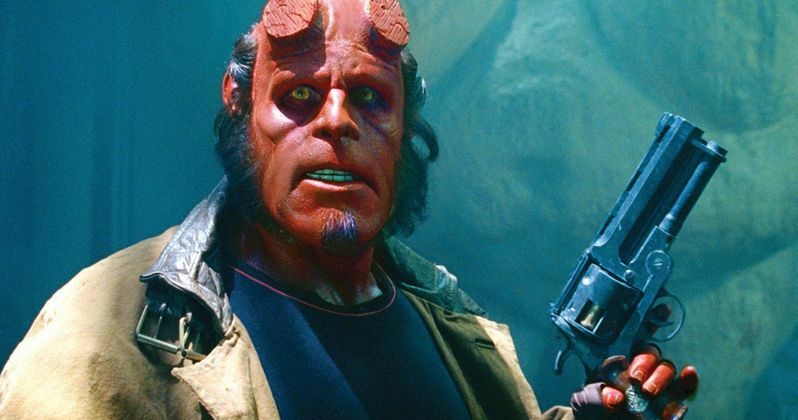 Of course, going with a reboot means Ron Perlman is finished as Hellboy. Del Toro and Perlman may be gone from the franchise, but Hellboy will continue on with next year's reboot. Stranger Things star David Harbour is taking the reins from Perlman, portraying Hellboy in the upcoming movie. Filling Perlman's shoes as the red superhero is going to be no easy task, but photos of Harbour in character certainly seem very promising. If Perlman has to be recast, Harbour seems to be a respectable replacement. Perlman ultimately only appeared as the character in two movies. However, his Hellboy is one of the most memorable superheroes of the modern era. It will be a little odd without him starring in next year's movie, but let's hope Marshall's vision with Harbour is just as entertaining in its own right. Perlman's interview was transcribed by Entertainment Weekly.